If you’re a regular follower of Thrifty NW Mom, you probably end up snagging a lot of good deals on pain medication, cold and cough elixirs and extra dental supplies. I know I do, especially from her Rite Aid posts! However, storing these items and keeping track of them can be a little overwhelming. 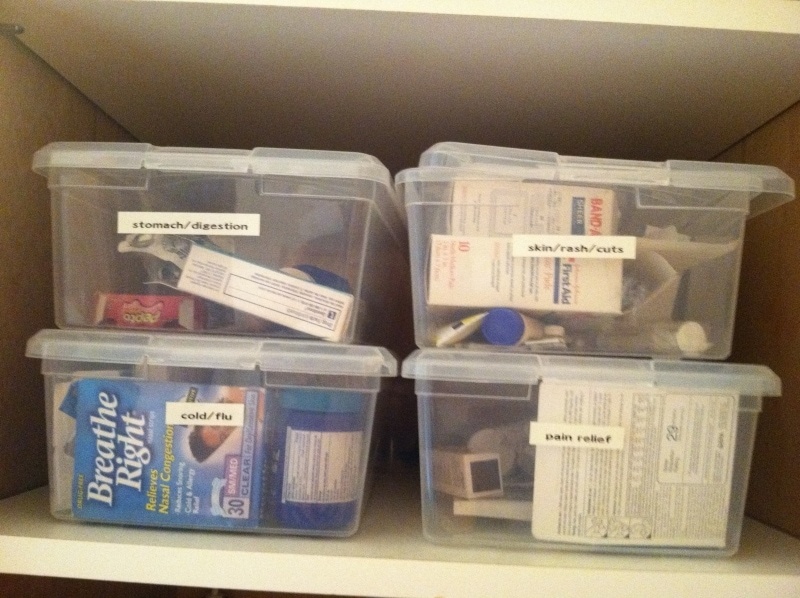 A few years ago, I reorganized my bathroom medicine cabinet using clear bins and the method has really worked for us so I thought I would pass it along. The first thing I did was check all the expiration dates. I was surprised how many items I needed to toss-oops! It is really important to do that! When you’re in the “heat” of the moment, you may not even have time to look at expiration dates! I purchased the clear Rubbermaid shoe box size tub s- 8 of them to fit in my lower bathroom cabinets. 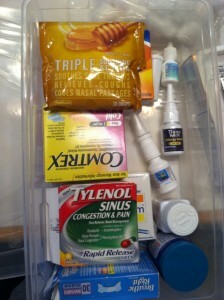 Sort all the different supplies and medications into categories & place in different bins/containers. Finally using my label maker (best wedding gift EVER), I labeled all the bins. I used the following categories: dental supplies, cotton balls/ q-tips, pain medication, soap/shaving cream, cold/flu, stomach/digestion, skin/rash/cuts, travel supplies/travel containers. These were the smaller extra items that seemed to be a BIG jumbled mess in my cupboard. And tada! No more crazy searching for medication or extra toothbrushes! Using this method also keeps me from going crazy buying “cheap” extras when they’re on sale. I know to keep the bins full, but realistically we won’t use more than what fits in the bins (this might be different depending on your size of family). We’d love to hear your organizational tips on storing and stocking your couponing “extras”! 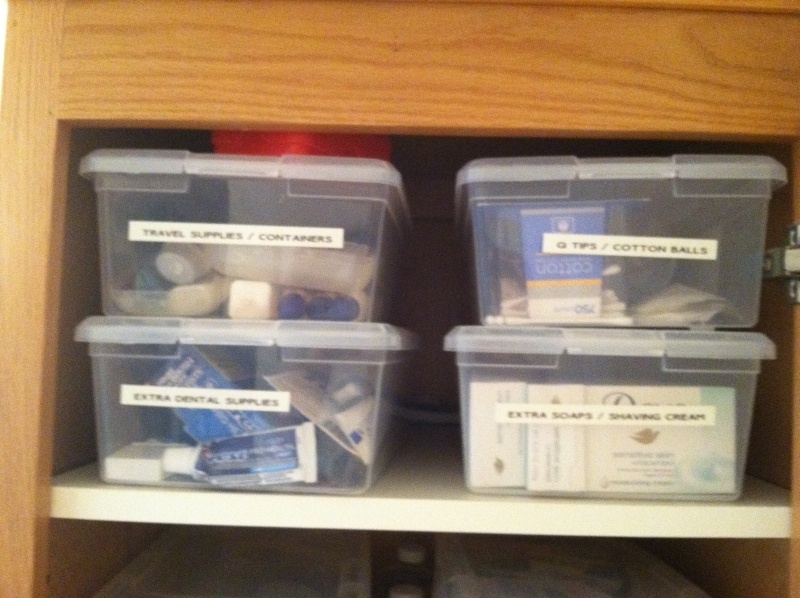 Even better, do you have pictures of your organized toiletry stockpile – we’d love to see them! Email thriftynwmom (at) gmail (dot) com with pictures! I’ve been doing this for years! I even included travel items and my fingernail polish and all of my pedi/mani products. About tossing out items beyond their “expiration date”, you might NOT have to do that. For example. 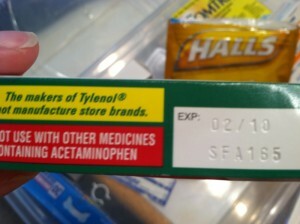 aspirin is still good for up to 15 years, yet it is stamped with a short term date. You don’t have to throw out the aspirin. For more info, ‘google’ for the news article about the Veteran’s Administration and ‘expiration dates’. Years ago, Congress passed a law that required short term ‘expiration dates’, but not all things really need them. At that time, the VA, which runs many hospitals, asked “what is the REAL effective date for expiration?” since the VA could not afford to throw away a lot of still good medical supplies, etc. and the REAL and TRUTHFUL expiration date for SOME things can be very long….but the law insisted that short term dates be posted. Look at the VA news article for details. Organizing today! Thanks for the idea! been doing this year years as well – however I have all my bathroom stuff in bins in the hall closet. it is so much easier to store them that way – here are my categories. tooth stuff – cotton balls – qtips – contacts – make up – hair – feminine products – medical (one for kids and one for adults) – first aide – travel bags – fingernail polish – ace bandage/ice packs – hair dye – shoes. Basically anything that is not nice to store goes in a box. I think I have 22 of them. Some categories have two boxes. I also put a 3 x 5 index card in the front of the box. My closet is pretty dark and I found that it was hard to read the label but with a white index card (blank) at the front of the box it really helped the label stand out more. PS Lucy thanks for the tip.